Nano DryFix shampoo is the new advanced hair cleanser to help rejuvenate and restore your hair! DryFix shampoo features a patented Micro Keratin Capsules technology that helps repair the hair cortex and spilt ends. 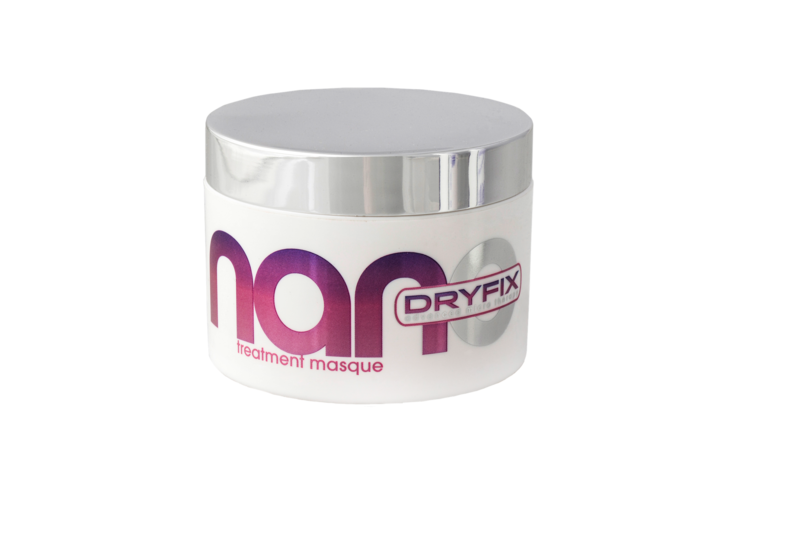 The regular use of Nano DryFix Repair Shampoo helps to prevent breakage and dryness to the hair. The shampoo is color safe because it is sulfate free. DryFix Treatment Masque features a patented Micro Keratin Capsules technology that helps to nourish and repair the hair cortex and spilt ends. The result is soft and flowing but more importantly it helps to break the vicious cycle of hair degradation and dryness. When using this treatment it reduces snags and pulls that will change existing damage hair to healthy hair. The regular use of Dry Fix Treatment Masque prevents breakage and helps make your beautiful hair grow healthier. DryFix Micro Therapy Leave In Treatment is an advanced micro therapy emulsion formulated to help restore the original moisture of your hair and repair damaged hair. The emulsion is comprised with Keratin Microcapsules, natural oils and essential fatty acids. Those micro beads surround the hair and attach within the damaged area helping to seal structural gaps and release a natural moisturizing protective layer on the hair shaft. The product then forms a thin reparative keratin protein patch which helps to restore the cuticle to its flexible integrity. It helps to weld spilt ends leaving the hair repaired and feeling brand new. It will make your hair beautiful, shiny and help make it grow longer without spilt ends. the hair cortex and rejoin split ends. These capsules surround the hair and attach within the damaged areas helping to seal structural gaps and release a natural moisturizing protective layer on the hair shaft. The spray simultaneously acts as a thermal heat protectant. The result is soft, flowing, beautiful hair. Regular use can help prevent further breakage, enhancing growth of longer smoother and shinier hair. Formulated for finer and limp hair.